Dear Readers, every day for the past fortnight I’ve been visiting St Pancras and Islington Cemetery in an act of faith. I’ve been carrying a jam sandwich laced with a homeopathic remedy, in an attempt to try to help a poor mange-ridden fox that I spotted a few weeks ago. And it appears that someone, at least, has been enjoying the unexpected sweet treat, because when I arrived on Tuesday I heard a scuffle, and saw a fox run, turn, and sit. 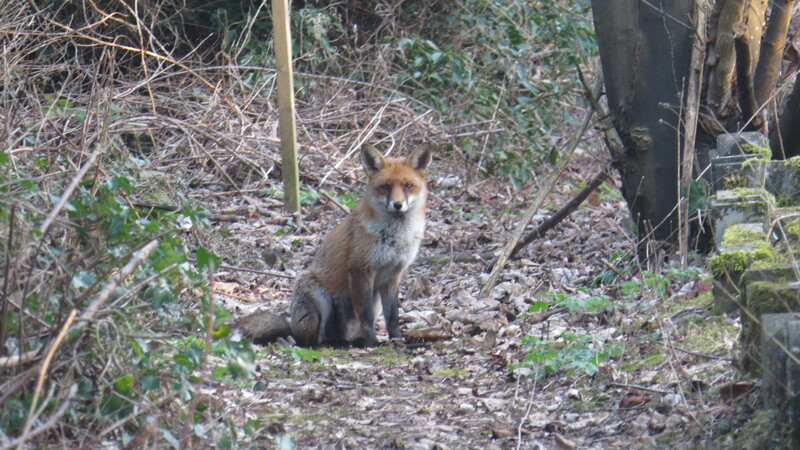 I crouched down and managed to get a few photos, but it was clear, sadly, that this was not ‘my’ fox. I hadn’t realised how individual the faces of foxes were, but one look at the two animals above and it’s clear that they are as different as those of two humans. I showed the fox my plastic bag full of jam sandwich, and walked very slowly to the mossy, primrose-covered mound where I always put the food down. 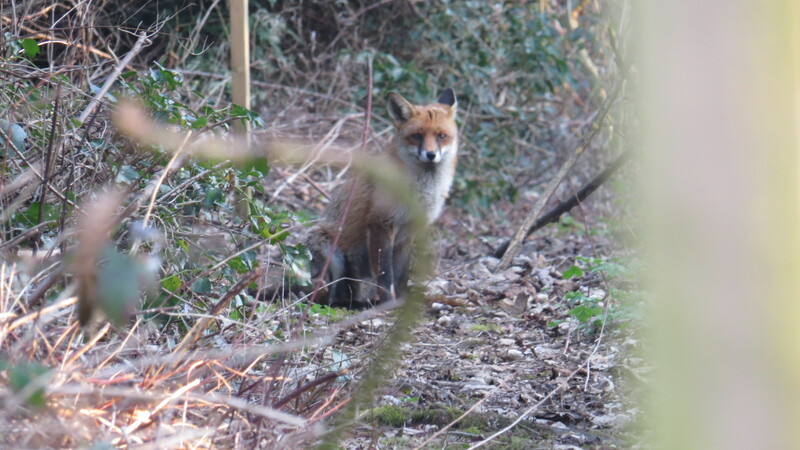 The new fox melted away into the undergrowth, but by the time I got back to the road and turned, s/he was already back. 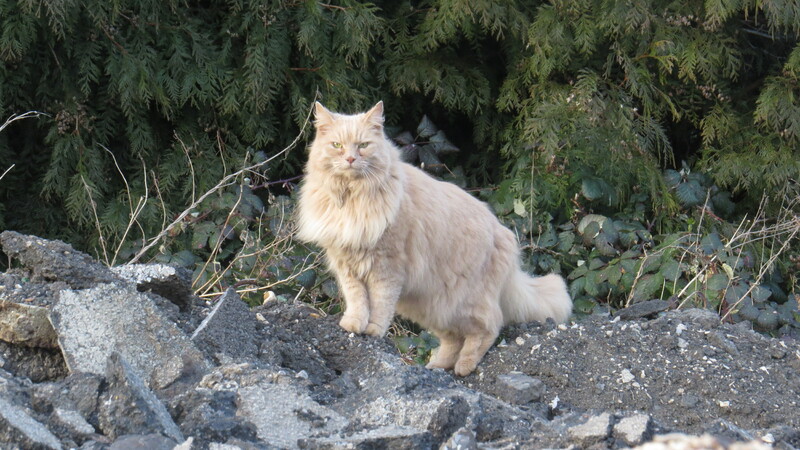 The low sun lit up the animal’s fur, turning it into copper and frost. For a few seconds, we were both transfixed. Then the fox gathered up the whole sandwich (which was cut into twelve pieces) and disappeared. So, it seems that it is at least a fox that is taking the food (rather than crows, magpies and woodpigeons) but I have no way of knowing if ‘my’ fox ever manages to get it. I have a fantasy that ‘my’ fox is a vixen who is being fed by this fox, but it’s very unlikely. I’ve been reading up about mange, and it appears that often it’s the less dominant animals, who are already more stressed, who are most affected by the disease. 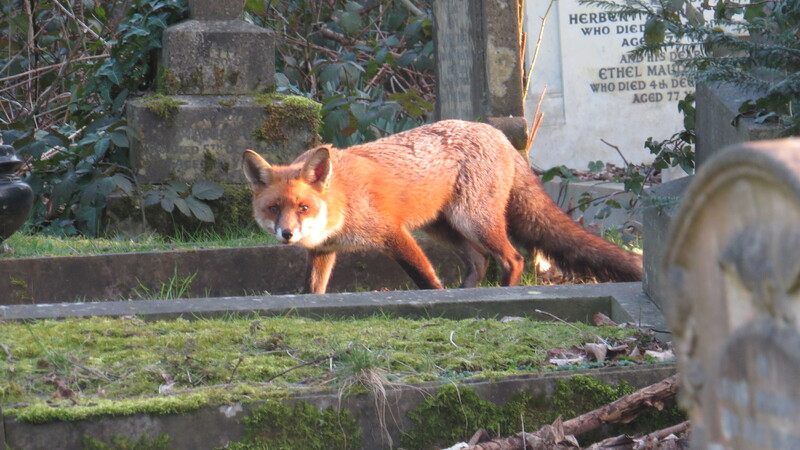 I’m hoping that if I go to the cemetery regularly I may learn more about the habits of the individual animals, and maybe I’ll be able to target my ‘offerings’ more effectively. Plus, I have allies! As I was walking back through the cemetery, the Dog Patrol vehicle drew up alongside me. ‘Oh, the birds and plants and the occasional fox’, I said. ‘I know you’re not allowed to take photos of the graves’. This is a bye-law, and I think it makes sense for more recent graves – no one wants their personal sorrow plastered all over someone’s blog. I’m not sure about those that are covered in ivy and long -neglected, but there you go. The Dog Patrol man grinned. ‘Great!’ he said, ‘So, can I ask you what camera you recommend, because I want to take some photos of the wildlife meself’. 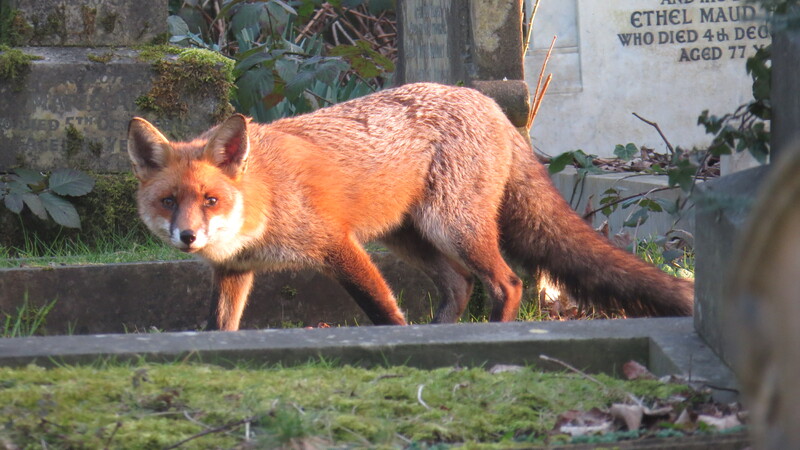 And so we had a long discussion on the merits of Canon vs Nikon, and the Dog Patrol man told me of some very unusual occasional visitors to the cemetery, which I hope to be able to share with you as soon as they cooperate. He also told me about some of the places where the foxes ‘hang out’, so I may be able to spot ‘my’ fox at some point in the future. However, it is not all good news in East Finchley. I got a message from one of the Friends of Coldfall Wood that something was amiss with the stream. I grabbed my camera and headed down, to find that the water of the stream was an unpleasant blue-green colour, something that reminded me of my experiments with copper sulphate when I was doing my chemistry O-level many decades ago. 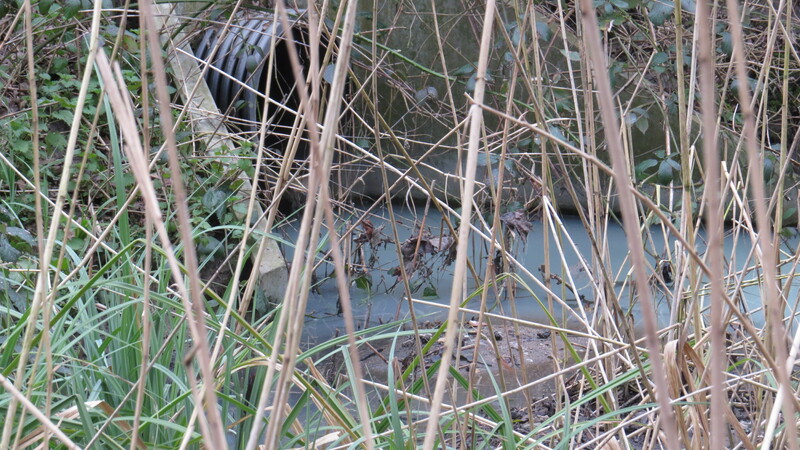 The local council has been informed, but at the moment we have no way of knowing what is causing the discoloration. . Much of the water coming into the stream runs off from the roads in the area, and it collects pollutants from many different places, which is one reason why a reed-bed was planted – the species used, Phragmites australis, helps to filter out unwanted nutrients and chemicals in the water. Generally the water runs clear, so I hope we can get to the bottom of what’s happening. It seems that I am having to learn many lessons about what I can and can’t control at the moment. Something is still murdering frogs in my garden, and yet, if I hadn’t built a pond, there wouldn’t be any frogs, or tadpoles, at all. The ‘wrong’ fox is eating at least some of my jam sandwiches. 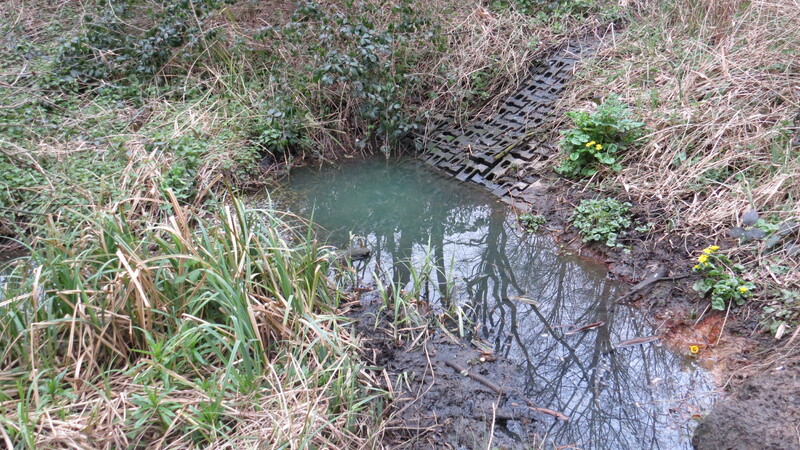 And now, someone has polluted the river in ‘my’ wood. I could spend my entire life in a state of high dudgeon and heightened blood pressure. But instead, I shall try to grow some more early-spring cover so it isn’t so easy for predators to pick off my frogs. I shall carry on with the jam sandwiches, but try to find out if there’s a more intelligent way to distribute them. 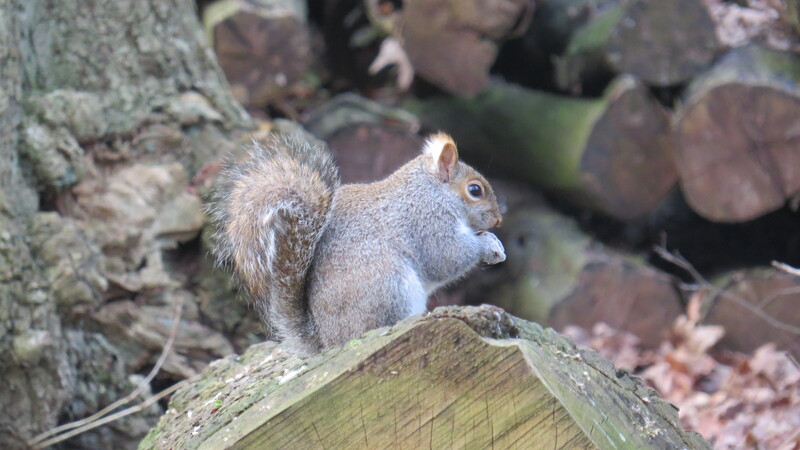 And I shall work with my pals at Friends of Coldfall Wood to see what we can do about the pollution issue. And in the meantime, I shall keep my eyes open for the moments of beauty that are all around me, every day, if I only pay attention. 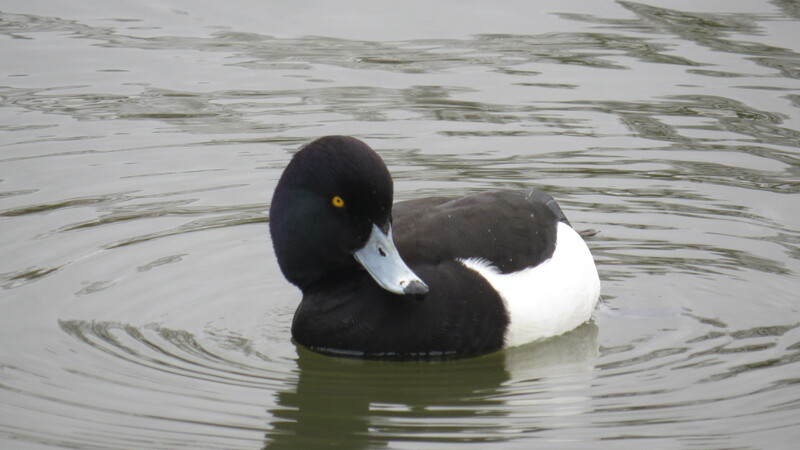 This entry was posted in London Birds, London Mammals, London Places, London Plants on March 19, 2016 by Bug Woman. Oh Bug Woman, if only every one of us could take care of their little corner of the planet, Mother Earth would be quite impressed! 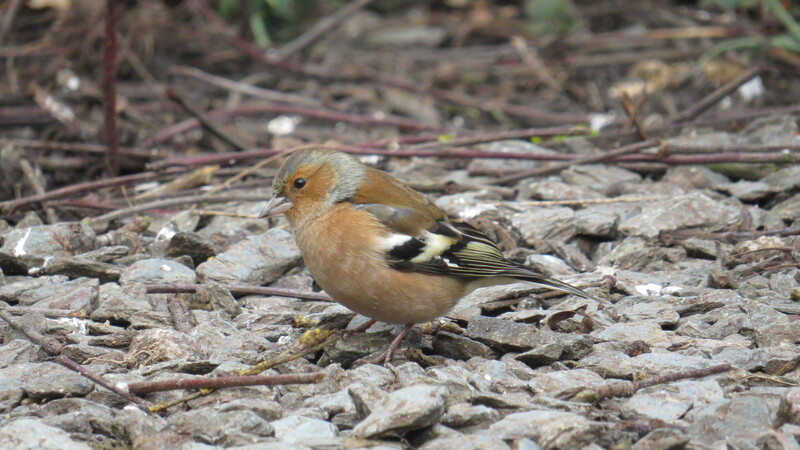 What a local wildlife mother Teresa you are…well done for keeping an eye on the flora and fauna of your local patch! Hope the mange fox does get to share your beautifully prepared tea time medicine laced treats and that you get to know where they hang out. 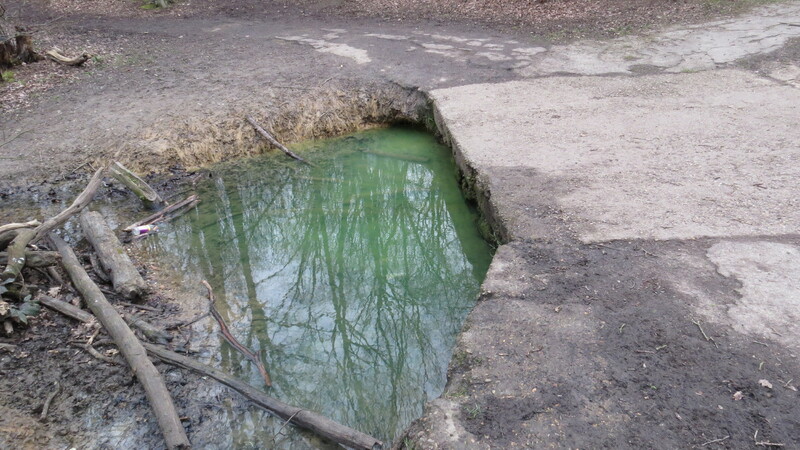 Is the water blue green algae? The council do have to respond to this if it is found. Loved Dusky the cemetery cat does he live ther in the wild or is it just his playground…he looks very clean and tidy and well fed? Hi Anne, no it’s not blue-green algae, definitely some kind of chemical spill, though it had more or less cleared when I investigated an hour ago. And Dusky the cemetery cat seems to live in the cemetery but has bed and board in the workman’s office. He is quite a hunter, for all his magnificence! And today I discovered a little group of jet black feral cats, who are fed by a local lady. 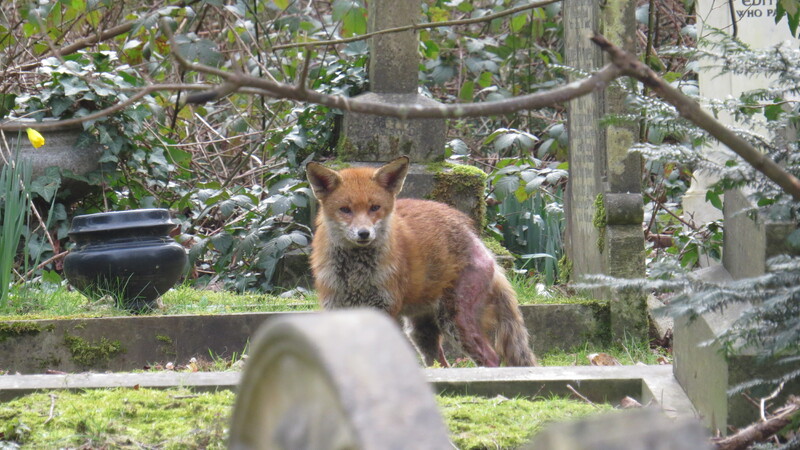 The cemetery gradually gives up its secrets…..
On a separate thing, can you recommend any good blogs on creating more of a wildlife/productive garden out of a fairly small garden (and one that needs to accommodate a dog!)? I can certainly recommend a couple of books: there’s Jan Miller-Klein’s Gardening for Bees, Butterflies and Other Beneficial Insects, and also Maureen Little’s The Bee Garden. 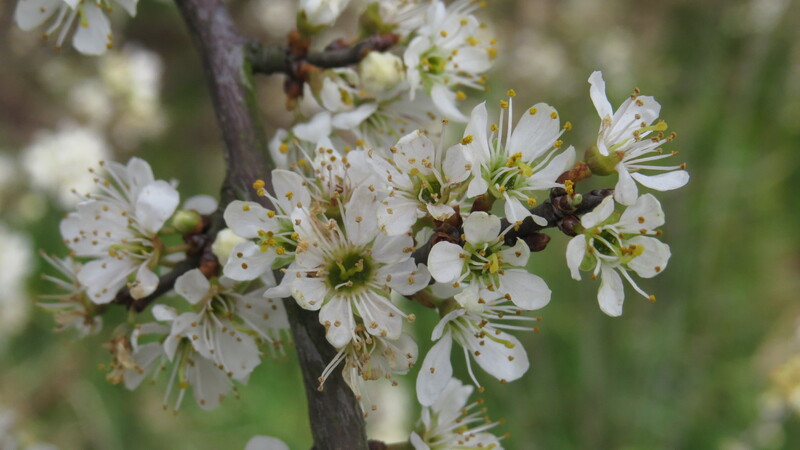 For an entertaining guide to what works and what doesn’t, there’s No Nettles Required by Ken Thompson, who says that we don’t need to worry – provided we have as much flowering over as long a season as possible, and provided we look after our soil, the critters will come :-). 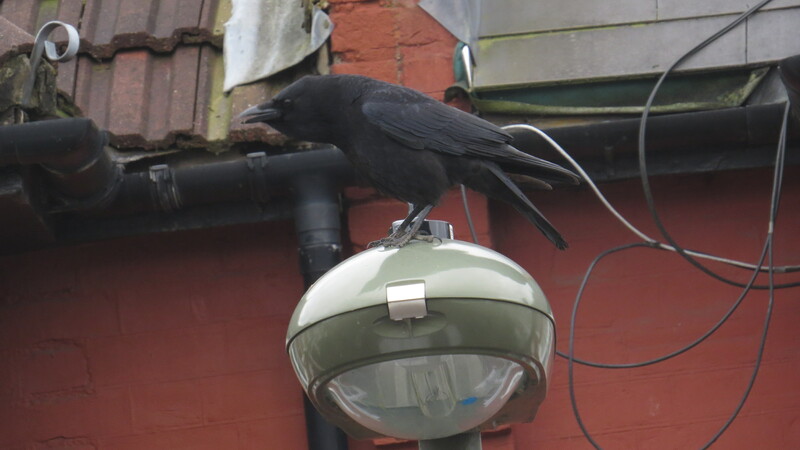 My personal advice (for what it’s worth as a relative beginner) would be: plant things that are happy in your particular soil and aspect, have a water source if possible (though it might be difficult with a dog :-)), hang up some bird feeders and see what happens. Pots can be great, because you can plant a bunch of seeds or plant some bulbs and just see what happens. One of the most interesting things I ever planted was a single purple sprouting broccoli seedling – I eventually let it ‘bolt’, which attracted all kinds of insects, and the caterpillars that were feeding on it attracted all kinds of predators. Fruit and vegetables can be wonderful for wildlife, if we don’t mind sharing :-). Nice post! That cat is gorgeus! Thank you, Maria. He is, isn’t he! He’s the king of the cemetery, for sure. A lovely post m’dear and the pictures of the foxes are rather stunning might I say. I enjoy your posts though I do not comment as often as I should but the ‘secret world’ of this graveyard is spellbinding and I hope that you soon share some more about it on your blog. Thank you, John! I’m in love with the graveyard, I must admit. I pop in most afternoons, thinking that I’ll just drop the sandwich and go, but there is always something intriguing to see. It has more people buried in it than any other cemetery in the UK (over a million, apparently), and what makes it special is the wild forested areas with their big Victorian speciman trees, redwoods and firs of all kinds. I think it will keep me busy for many years to come! And thank you for commenting – I hope that you’re doing ok! The mysterious green color in the stream reminded me that in Chicago, the good citizens there celebrate St. Patrick’s Day by dyeing the river that runs through part of the city green! Could something similar have taken place in East Finchley? Looking forward to more of your sleuthing through the wilds of Coldfall Wood. Hi Katya, you know, I hadn’t thought of that, but you could well be right! St Patrick’s Day is a pretty big deal around here as well, and although there is no official colouring of waterways, it wouldn’t surprise me in the least if someone had taken it upon themselves to do some ‘dyeing’. I shall let you know if I find out anything more, though the river looked fine yesterday…. I understand what you mean about the temptation to feel despairing at times, but you’re right to notice all the things that thrive despite human activity/ carelessness and worse. I always feel cheered when I notice any plants squeezing up through Tarmac or concrete.